Tripura, along with the rest of the nation celebrated 72nd Independence Day amidst tight security on Wednesday. There has been no report of any untoward incident from any part of the State till noon. 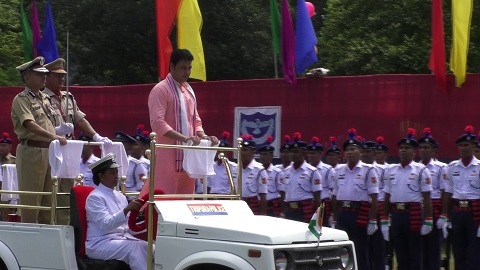 In capital Agartala, State Chief Minister Biplab Kumar Deb unfurled the national flag at Assam Rifles ground in presence of his Cabinet colleagues, top administrative, security officials and hundreds of people who gathered to take part in the celebration. Along with NCC cadres and students, various security forces and paramilitary including state police, TSR, CRPF, BSF, and AR took part in the parade. For the first time from neighboring Mizoram, the state police have also participated in the parade. As part of the celebrations, Assembly, Raj Bhavan, Civil Secretariat and High Court building was illuminated with decorative lights. Law enforcement agencies have already fully geared up to ensure incident-free celebrations of Independence Day. Additional troops are being deployed at important locations to keep troublemakers at bay.